If you’ve never seen a persimmon before, you might say it looks like a tomato or an apple, but the persimmon is quite distinct in the fruit family. When a persimmon is ripe, it’s one of the sweetest of all fruits. Persimmons are not very well known in the United States, but they have long been widely prized in Asian cultures for their medical and nutritional value. Even though persimmons are grown in America, it’s the Asian varieties of the persimmon that are most commonly sold in California, which produces 99 percent of the U.S. persimmon crop. Typically, persimmons are only available for about three months, from late September through December. There are two main Asian varieties of permissions, the Hachiya and the Fuyu. The Hachiya is incredibly sweet when soft and ripe. It’s acorn-shaped with a shiny, bright orange skin, and a pale-green, papery, leafy cap. The Fuyu, a newer variety, has had the tannic acid bred out of it. Fuyu persimmons—now representing almost 80% of the persimmon market—are squatter and rounder than the Hachiya. 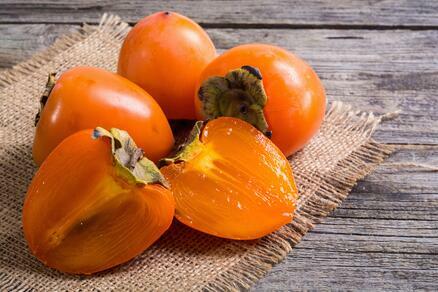 The Fuyu persimmon is yellow-orange and is eaten when firm. To ripen Hachiya persimmons, place the fruit in the freezer overnight. Remove the fruit from the freezer and allow the cold-ripened fruit to thaw. One way to remember the difference: The words Fuyu and apple have the same number of syllables. Hachiya and tomato have the same number of syllables. Fuyus, like apples, are crisp and eaten when firm. Hachiyas, like tomatoes, need time to ripen. Permissions contain both soluble and insoluble dietary fibers. They also contain epicatechin and the following minerals and elements: sodium, potassium, magnesium, calcium, iron, and manganese. What is epicatechin, you ask? It’s an antioxidant. Studies suggest that epicatechin could help prevent age-related cognitive decline and depression, and its use is inversely associated with death from coronary heart disease. Permissions contain both manganese and magnesium. While our bodies need both minerals to function properly, most Americans don’t get enough of either one. The words manganese and magnesium both come the word magnesia. At one time, they were referred to as black magnesia and white magnesia. Medieval alchemists—who for centuries sought a way to turn base metals into gold—once thought that magnesia was an important component of the legendary Philosopher’s Stone, a mythical substance that they believed would turn any substance to gold and produce the Elixir of Life. But while the Philosopher’s Stone is now generally only found in Harry Potter stories, you might regard the nutritional properties of magnesium and manganese to be downright magical! Manganese can help the body with metabolism, bone development, and wound healing. Some of the best sources of manganese include whole grains, nuts, sweet potatoes, pineapple, leafy vegetables, and teas. Magnesium assists with bone health, energy metabolism, and the activation of enzymes crucial to the health of neurons and muscles. Create a fall-inspired salsa with chopped persimmons, white onion, peppers, lime juice, and fresh basil and mint. Add persimmon slices to a charcuterie board with sliced meats and cheeses for a memorable holiday appetizer. Slice persimmons, oranges, and roasted beets and place them on top of some leafy greens for a delectable and sweet salad. Simmer persimmons with cinnamon and a little sugar to create a sweet compote to serve over vanilla ice cream. Blend persimmons with bananas and tangerines for a unique and flavorful smoothie.